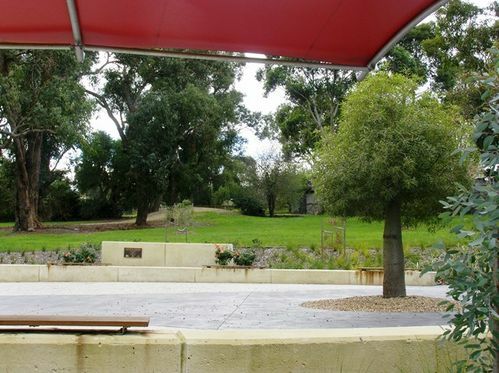 A garden commemorates those who lost their lives or were affected by the Black Saturday bushfires of 2009.The memorial features two plaques, memorial wall and seating and a tree in a large circular area. It also pays tribute to the emergency services, volunteers, government agencies and charities that helped local residents during the Bunyip Ridge fires of the same time. Twenty firestar rose bushes, bred and donated by Rob Wakelam whose farm was threatened in the Black Saturday bushfires, were planted at the memorial. The firestar rose bushes, the official rose of the CFA, are expected to bloom in 2014 in time for the anniversary of the Black Saturday bushfires. The roses are an important feature of the new memorial at the park in Bunyip. The ceremony was held on the 6th July 2013 to present the memorial to the local community. Council officially opened the memorial in February 2014, to coincide with the fifth anniversary of the Black Saturday bushfires. The memorial was funded by the State and Federal Government’s Community Recovery Fund, with additional funding by Council. The Bunyip ridge fires destroyed 31 homes, including that of Cardinia Shire resident Fred Wailes, and burned through 26,200 hectares by the time they were contained early in March 2009. In February 2009, the Victorian and Commonwealth Governments jointly established the $10 million Community Recovery Fund to assist in community development and recovery after the Victorian bushfires. Funding of $2.5 million was allocated for memorials and commemorative events and has supported the creation of 59 memorials across 18 councils through extensive consultation with those communities impacted by the fires. The memorials include walls, sculptures, places of reflection, storyboards, lookout towers, roadside stops, shelters, signage, murals, plaques and seating, commemorative gardens and rotundas. The aim of the collection is to provide a complete and historic photographic record of the memorials created after the 2009 Victorian bushfires.